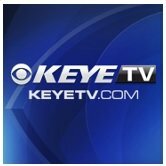 News TV Channel / KEYE-TV, virtual channel 42 (UHF digital channel 43), is a CBS-affiliated television station located in Austin, Texas, United States. The station is owned by the Sinclair Broadcast Group. KEYE's studios are located on Metric Boulevard in North Austin (it is one of two area television stations whose studios are located in that section of town – ABC affiliate KVUE, channel 24, being the other), and its transmitter is located on Waymaker Way on the west side of Austin.